The Betgames Wheel of Fortune is based on one of the oldest forms of gambling. You can find Wheels of Fortune in most Land Based casinos in areas where traffic flow is often the most and away from the “tables”. It’s used very much a “throw away” wager, something to bet your loose change on or the small chips that you can’t be bothered to cash in. It’s a popular game that doesn’t really need a lot of explaining. The wheel has 19 segments that are numbered 1 to 18. The 19th segment has a special symbol of a cup and star and this acts very much like a single number bet that pays 18:1. A game round is run every 5 minutes. All bets need to be placed before the wheel is spun. The wheel is spun in a clockwise direction and has to complete 3 revolutions to be a valid spin. Betting is very straight forward. You can bet on Numbers, Colours and Odds / Evens. 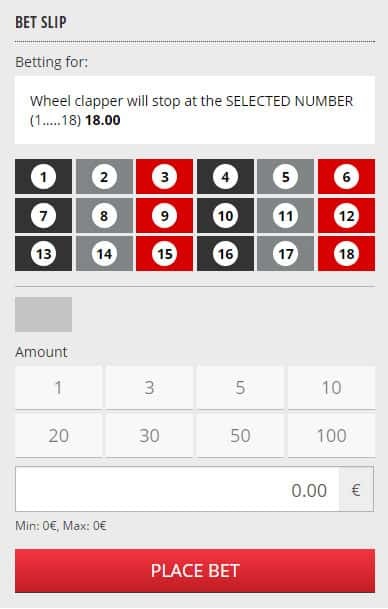 You can bet on single numbers, ranges or high/low numbers. All pay slightly different odds. The colours are dispersed evenly around the wheel. 3-1 odds, the same as columns in Roulette. Even money bets with a difference. 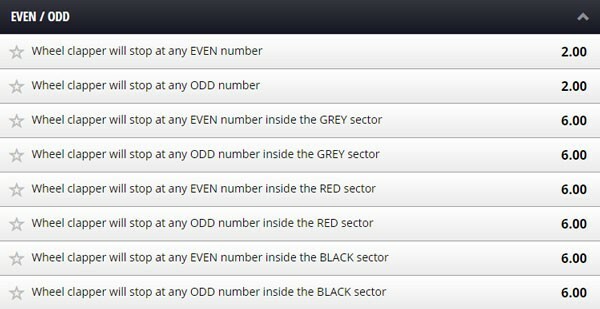 Extended odds are available if you bet on odd/even within a colour. Just select the bet you want from the table and the Bet Slip will change to give you all available options for the bet. The game rounds end very quickly and the live stream is cut soon after the results have been displayed. For those not quick enough to see them (that’s me) they are displayed on the splash screen for the game. The results can also be found on the results page for all games.